I pretty much quit performing when my kids were born. I didn't stop doing music, I just did nearly all of it in a less-than-300-square-foot room in a commercial building a few blocks east of downtown Austin. I was writing music for other people, so between that demanding most of my creative energy, and having no particular outlet for performing, there didn't seem to be any great pressing cause to write any new songs of my own. But then, when my kids got to be around 3 and 4, my buddy George hipped me to something he had just discovered called February Album Writing Month, or FAWM. FAWM is an online songwriting challenge with a very simple premise – sign up, create a profile, then write and upload fourteen new songs between February 1 and February 28. That averages out to a song every other day for four weeks – theoretically, you aim for 14.5 songs during a leap year, har har har. That's a pretty rapid clip, for sure, but I was hooked from the very first morning, when it got me to show up at my studio, sit down at my desk, and crank out and demo a brand new song before lunchtime. I don't know what it is about deadlines, but they get me going. Emily Remler talked about "ordering up a song," which is an image I've always liked. Having a deadline like FAWM just means putting in an order every couple of days and seeing what happens. And that idea dovetails nicely with another, more recent idea I really like: the results of a study done in a pottery class. Now, given that "be-sandaled kickwheel potter in Vermont" was high on my list of childhood ambitions (cartoonist, garbage man and guitar player were, at various times, the other ones, so, feeling lucky for how that turned out), I'm partial to most anything involving ceramics, but check this out: According to the study, they divided a class of art students into two groups. They told Group A they would be graded on just one piece of work, a piece they could spend the whole semester on. They told Group B they would be judged on volume: how many pots could they crank out in 12 weeks? At the end of the study, they took the single best piece out of each Group B student's total output, and put those pieces up against the single pots made by the group A students. When judged independently, the Group B work was deemed better than the Group A work across the board. Now, passing lightly beyond the inherent subjectivity of judging sculpted housewares as better or worse (see Sally Brown's defense of her "C" sculpture in Peanuts), the lesson here is: better to make a lot of stuff – to attempt, reflect and learn, and move on to more attempts – than to doggedly continue perfecting the same thing over and over. Seen in that light, it makes nothing but eminent good sense to try and crank out a song every couple days for four weeks. The pace will keep you moving – no time to agonize over the perfect simile, the perfect chord change, the perfect take – and the number of attempts will raise your chances of coming up with at least a few keepers by the end of the month. That's been my experience, at least, and it always reminds me of George Gershwin's alleged dictum that "it takes eight bad songs to get two good ones." Of course, if the two you get that way are George Gershwin songs, it's definitely worth slogging through the other eight. If you're just getting two of your own songs for the effort...maybe not so much, though still a respectable average. Even if the pot study is apocryphal – and it could be, given that I can't seem to find a definitive source for it, just other smart-alecks like me citing it in their own words – I think the logic is sound, and even applies to more ephemeral experiences like practicing. Show up, do a little work, turn the page, show up again tomorrow. If you keep working in a concise, focused fashion on a few specific skills, tunes, techniques, you'll get incrementally better over time, and improve those practice skills in the bargain. As opposed to sitting down for four hours on a weekend afternoon to hammer away yet again at one hellaciously advanced arrangement or complex improvising scenario that's been just out of reach for months, only to avoid it again for a week or two. 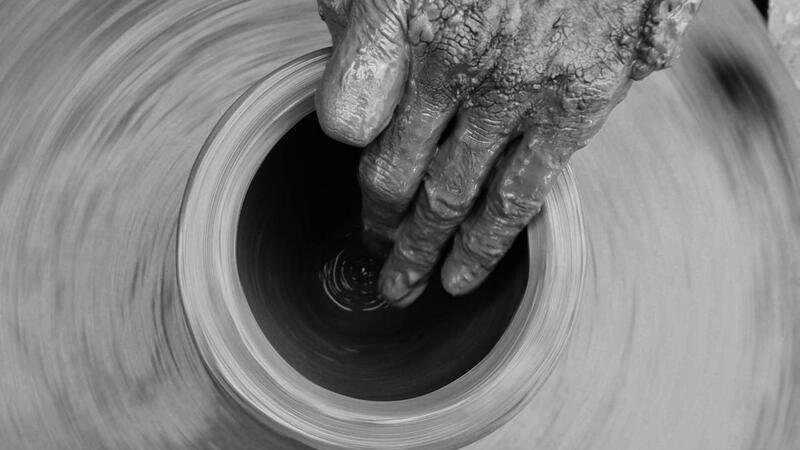 So what do you think: are you a Group A potter or a Group B potter? I've had it mind to do a post about practicing for a while now, so if you've got any questions in that department, drop me a line. Do you have limited time to practice, do you have trouble deciding what to practice, do you feel like practicing is not getting you where you want to go? Let me know. In the meantime, having recently come across this Malcolm Gladwell podcast on Norwegian Death Metal, I just have to share. It made me laugh out loud more than once, and I even learned a few things, too. The Epistemology Of Norwegian Black Metal (note: parts of this, especially the final song, are not necessarily work- or kid-appropriate. It is Black Metal, after all). I'll be back with a new video lesson next week.